337 Marlborough is located on the north side of Marlborough, between Gloucester and Hereford, with 8 Gloucester to the east and 339 Marlborough to the west. 337 Marlborough was built ca. 1872 for builder and contractor George Martin Gibson, for speculative sale, one of eleven contiguous houses (337-339-341-343-345-347-349-351-353-355-357 Marlborough). George Gibson purchased the land for 337-357 Marlborough on September 10, 1871, from George Williams Pratt, an investment banker and stockbroker and one of the founders of the Boston Stock Exchange. He and his wife, Mary Barrow (White) Pratt, lived at 13 Louisburg Square. They also maintained a home, Oakley, on Belmont Avenue in Watertown (it became the Oakley Country Club in 1898). The land originally was part of a larger parcel purchased from the Boston Water Power Company on February 20, 1863, by George Pratt’s son, Robert Marion Pratt, also a banker and broker. As originally designed, the eleven houses were organized in a symmetrical block comprising all of the houses facing Marlborough between Gloucester and Hereford. All but 347 Marlborough, in the center, were identical, with the same façades and fenestration, with the three houses at the east (337-339-341 Marlborough) with bays on the east side, and the three houses on the west (353-355-357 Marlborough) with bays on the west side. 343-345 Marlborough and 349-351 Marlborough are symmetrical pairs. 347 Marlborough, in the center, has unique third floor fenestration and window lintels. 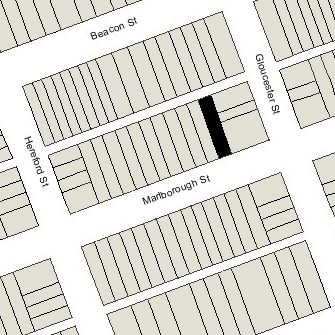 George Gibson also had built four houses at 14-16-18-20 Hereford, at the northeast corner of Hereford and Marlborough, which he had completed and sold to individual buyers between October of 1871 and January of 1872. On January 1, 1872, George Gibson sold the land “on which I am now building eleven dwelling houses” to Hiram A. Gerrish, a building contractor and real estate dealer, who sold the houses, once they were completed, to individual buyers. Click here for an index to the deeds for 337 Marlborough. On November 15, 1873, 337 Marlborough was purchased from Hiram Gerrish by Joseph McIntire, a wholesale provisions (produce) merchant in partnership with Elbridge G. Knight in the firm of Knight & McIntire. On the same day, Hiram Gerrish also sold Joseph McIntire 345 Marlborough, 355 Marlborough, and 357 Marlborough, and sold Joseph McIntire and Elbridge Knight, as partners, 347 Marlborough and 351 Marlborough. They purchased the houses as rental property or for re-sale. Joseph McIntire was unmarried and lived at 92 Waltham with his cousin, Miss Abby A. Rogers. Elbridge Knight was a widower and lived at 416 Columbus. He remarried in December of 1877 to Helen E. Davis; after their marriage, they lived at 416 Columbus. By 1873, 337 Marlborough was the home of Joseph Howe Wales and his wife, Isabelle (Webb) Wales. He was a ship owner and East India merchant in his father’s firm and then an insurance broker. They continued to live at 337 Marlborough in 1874, but had moved to 1 Exeter by 1875. By 1875, 337 Marlborough was the home of Lemuel Rice Howe and his wife, Martha Ada (Silsby) Howe. They previously had lived in Dedham. He was a dealer in dyewoods, analines, and extracts, and later also was a commission merchant in the Calcutta trade. They continued to live at 337 Marlborough during the 1878-1879 winter season, but moved thereafter to 33 Fairfield. By the 1879-1880 winter season, 337 Marlborough was the home of boot and shoe manufacturer George Martin Coburn and his wife, Louise (Gage) Coburn. They had married in October of 1879 and 337 Marlborough probably was their first home together. They continued to live there during the 1889-1890, but moved thereafter to 402 Marlborough. By the 1890-1891 winter season, 337 Marlborough was the home, Miss Annie Norton Ward and Miss Charlotte Sprague Ward, sisters, and their brother, Harold Ward. Harold Ward moved in about 1894 to Mt. Vernon Street, and Charlotte Ward married in June of 1897 to Henry Harrison Sprague, a lawyer, and moved to 33 Fairfield. Annie Ward continued to live at 337 Marlborough until about 1900, when she traveled to Europe. During the 1899-1900 winter season, 337 Marlborough was the home of Miss Louise Porter Haskell, a student at Radcliffe and a teacher. Miss Haskell had moved by 1901 to 314 Marlborough, where she was joined by her sister, Mary Elizabeth Haskell, who established the Haskell School for Girls there. By the 1900-1901 winter season, 337 Marlborough was the home of Henry Smith Pritchett and his wife, Eva (McAllister) Pritchett. He had been named president of MIT in March of 1900; he previously had lived in Washington DC, where he was superintendent of the United States Coast and Geodetic Survey. The Pritchetts had married in June of 1900 in Chevy Chase, and 337 Marlborough probably was their first home together. They continued to live at 337 Marlborough in 1902, but moved soon thereafter to 174 Bay State Road. In about 1903, Miss Mary Caroline Spencer May established a private school at 337-339 Marlborough. Her sister, Lucy Isabelle May, joined her as a teacher in the school. They previously had taught at Miss Sarah Alice Brown’s school at 66 Marlborough, and had lived at 13 West Cedar with their mother, Mary Caroline (Painter) May, the wife of Charles William May, who was living abroad. In the early years after starting the school, Mary May lived at 339 Marlborough and maintained the school a 337 Marlborough. Her mother and sister, Lucy Isabelle, lived with her. By 1908, they had moved their residence to 438 Marlborough, and by 1910 they were living in an apartment at 222 Marlborough. She continued to operate the school at 337-339 Marlborough. 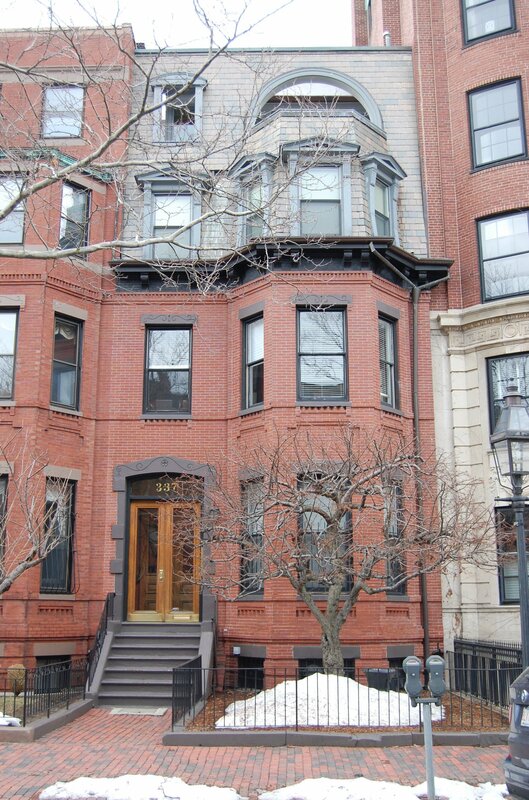 On May 15, 1908, Mary and Lucy Isabelle May purchased 337 Marlborough from the estate of Joseph McIntire (who had died in June of 1903), and in June of 1912, Mary May acquired 339 Marlborough. On June 3, 1913, Lucy Isabelle May transferred her interest in 337 Marlborough to Mary May. From 1910, only the staff (and possibly some students) lived at 337-339 Marlborough. The school continued to be located at 337-339 Marlborough until late 1926, when it moved to 270 Beacon. In June of 1927, Mary May applied for permission to raze 337-339-341 Marlborough and replace them with an apartment building to be designed by architect Edmund L. Leeds. She did not own 341 Marlborough. She subsequently abandoned the application. On June 8, 1928, 337 Marlborough and 339 Marlborough were acquired from Mary May by real estate dealer George S. Maloof. In August of 1930, he filed for (and subsequently received) permission to convert each building from a school to a “dwelling,” the number of occupants not being indicated. In a separate application filed the same month, he applied for (and subsequently received) permission to construct a fire escape connecting the two buildings, indicating that the use was to be for “lodgings.” No formal request to change the legal occupancy to a lodging house appears to have been filed. On October 30, 1930, 337 Marlborough was acquired from George Maloof by Miss Rose A. Brittany, who operated it as a lodging house. On June 26, 1933, the Conveyancers Title Insurance and Mortgage Company foreclosed on its mortgage to Rose Brittany and transferred 337 Marlborough to Realty, Inc.
Rose Brittany continued to live at 337 Marlborough and operate it as a lodging house until about 1936. 337 Marlborough continued to be owned by Realty, Inc., and operated as a lodging house, with various resident operators. By mid-1940, 337 Marlborough was the home of Percy Cecil Chadbourn, a cook, and his wife, Zeralda Yvonne (Morel) Chadbourn. They previously had lived at 28 Cumberland. In July of 1940, Mrs. Chadbourn applied for a license to operate a lodging house at 337 Marlborough, and on July 11, 1940, the Building Department wrote informing her that she would be required to secure a change in the legal use of the property before it could be used for that purpose. The Chabourns moved soon thereafter and by 1942 were living at 122 Ward in Roxbury. The Building Department files do not include a record of a change in use being requested. However, the property continued to be used as a lodging house. Realty, Inc., went bankrupt and on October 16, 1942, George Alpert, the court-appointed receiver for Realty Inc., transferred 337 Marlborough to the Conveyancers Realty Company. The property changed hands and on October 27, 1944, was acquired by Margaret B. Conley, who operated it as a lodging house. She previously had lived at 192 Bay State Road. She continued to live and operate a lodging house at 337 Marlborough until about 1962. The house was shown as vacant in the 1963 City Directory. On November 15, 1962, 337 Marlborough was acquired from Margaret Conley by Miss Caroline P. Bowditch. She lived at 146 Beacon with her sisters, Ruth William (Bowditch) Munro, the widow of Willis Munro, and Marion (Bowditch) Steeves, the former wife of Walter Bingham Steeves. On May 20, 1963, 337 Marlborough was acquired from Caroline Bowditch by architect and real estate dealer Thomas Byrd Epps and his wife, Margaret Killeen (Lonval) Epps. They lived at 1 Otis Place and then, by 1965, in an apartment at 321 Dartmouth. In June of 1963, Thomas Epps filed for (and subsequently received) permission to convert the property from a lodging house into five apartments. On August 20, 1975, 337 Marlborough was acquired from Thomas and Margaret Epps by Richard Ramsey Porteus, a lawyer, and his wife, Judith E. (Hodge) Porteus. They lived in one of the apartments. They previously had lived in an apartment at 66 Commonwealth. The property changed hands and on September 2, 1983, was purchased by Miss Mildred G. Broome. In October of 1983, she applied for (and subsequently received) permission to remodel the third and fourth floors, including extending the mansard and rebuilding the front section of the roof. In November of 1985, she applied for (and subsequently received) permission to reduce the number of units from five to four. On March 14, 2002, 337 Marlborough was purchased from Mildred Broome by Louisa H. Garrison. On June 26, 2003, she converted the property into four condominium units, the 337 Marlborough Condominium.